documenta 14 is founded on several important institutional partnerships in Athens and Kassel. Each of these individual relationships with institutions—and the people who make them work—results in specific programming, research, and collaborative projects. Working together with partner institutions, documenta 14 points to a public sphere that is non-exclusionary and defined by encounters and possibilities—a public sphere in space and time. Four years in the making, documenta 14 has gradually established a presence in Athens— and it now becomes visible, audible, and otherwise palpable through the multitude of voices that sustain the continuum of the exhibition during its one hundred days. 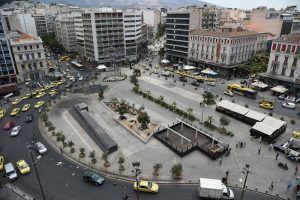 Spaces and places of documenta 14 in Athens include museums, cinemas, theaters, libraries, archives, schools, television, radio, university auditoriums, public squares, streets, clubs, shops, parks and paths, and residential buildings—in short, all that comprises the great city in its density, richness, and strange beauty. ASFA was the first institution to partner with documenta 14 in the Greek capital, and here Learning from Athens is manifested as an exploration of creative formation and educational experimentation. Since the fall of 2016, Arnisa Zeqo of aneducation (the public education program of documenta 14) has led Elective Affinities, a seminar inviting students from various departments to engage with documenta 14 artists. The exhibition in the lofty galleries of the N. Kessanlis Exhibition Hall reaches beyond Athens, examining work from Ciudad Abierta, or “Open City,” founded outside Valparaiso in Chile, from Rabindranath Tagore’s Santiniketan school in the Bengali countryside near Kolkata, and from Matanzas, the “Athens of Cuba”—to name just three key schools and sites of learning that documenta 14 examines. The music program at the Megaron brings attention to crucial sociopolitical moments expressed through or exemplified by musical compositions and their makers. As an extension of the regular programming at the Megaron, the series brings about alternate ways of listening and an encounter with sound’s dissident and defining mechanisms. In addition to the concert program, a set of spatial interventions makes use of the Megaron’s architectural features and engages the building’s foyers and various other interstitial spaces, while questioning the “ideal” musical conditions for which such institutions typically strive. From this storefront on a pedestrian street, it is a short walk to Victoria Square, a low-key crossroads for people of myriad nationalities, who have recently settled in or are passing through Greece. In spring 2016, Victoria Square made the news when it became a makeshift refugee camp, mostly for people fleeing violence in Afghanistan and Syria. More recently an Iraqi-Kurdish restaurant has opened on the square’s northwest corner, and in the Café des Poètes across the way, you may hear stories of film shoots in this once posh neighborhood or learn how the central historical statue of Theseus rescuing Hippodamia was fired at during the Civil War of 1946–49. In this zone marked by the coming together of many peoples, artist Rick Lowe works with local initiatives to forge connections, initiating dialogues that link arts and culture with small businesses and support networks for immigrant and refugee groups. The pavilion, adjoined to the Church of Agios Dimitrios Loubardiaris, combines techniques gleaned from the stone foundations of the Acropolis with a traditional Japanese building aesthetic. It has become the temporary home for Elisabeth Wild’s small, brightly colored collages, whose surreal landscapes defy any predictable visual logic. Nearby are Vivian Suter’s paintings made in the crater of a volcano on the island of Nisyros; some include direct traces of the natural environment—dirt, mold, and seawater. Further up the path is another monument to vernacular architecture, a hand-carved marble tent by Rebecca Belmore that looks straight onto the Acropolis. A main work on view at the Polytechnic is a model proposed by artist Rainer Oldendorf, which is inspired by the Functional City exhibition mounted in Athens in 1933. The exhibition was the culmination of the fourth Congrès Internationaux d’Architecture Moderne (CIAM 4) held on board a ship traveling from Marseilles to Athens. Congress participants included the avant-garde of the international modern movement—such as Alvar Aalto, Cornelis van Eesteren, Sigfried Giedion, Le Corbusier, Ferdinand Léger, Charlotte Perriand, and Josép Lluis Sert. Ten years after CIAM 4, Le Corbusier brought the ideas of the Congress together in his “Charter of Athens”, laying the groundwork for the reconstruction of European cities after the war in the spirit of functionalism. Inspired by these events, Oldendorf’s model borrows from the format of the CIAM exhibition and has been developed in collaboration with students and professors of the Athens School of Fine Arts, the National Technical University of Athens, the University of Thessaly, the Institut Supérieur des Beaux-Arts de Besançon/Franche-Comté (ISBA), and the University of Kassel. The artist-run space Center for the Fine Arts, founded by an independent artist group (Kleopatra Digka, Thymios Panourias, Yannis Psychopedis, Yannis Valavanidis), was active from 1974–76 at Tositsa 5. Since the 1980s the storefront has served a retail space, first as a store for audiovisual equipment and later for parquet floors. For the past three years the space has remained closed. Now Georgia Sagri presents a continuum of performances and sculptural forms that extend from this site out into the city. Her interventions in Athens are also being performed simultaneously in Kassel.